LG 50PW450 review | What Hi-Fi? Just £800 for a 50in 3D plasma seems a steal, but sacrifices have to be made to hit that price. And sure enough, the LG 50PW450 has an HD-less Freeview tuner and no internet content (there isn’t even a LAN port for software updates). Like other similarly priced TVs it’s also HD Ready, rather than Full HD. It looks like some corners have been cut in the styling department, too, as the bland aesthetics make it look more like the kind of monitor you might see in a departure lounge than a living room. This is actually an active 3D set, which is unusual – LG is publicly pushing passive (which it brands Cinema 3D) as its chosen 3D tech. Before finding out whether the PW450’s 3D performance reflects LG’s lack of love for active, it’s vital that you calibrate its picture, as fresh from the box it looks like a real dud. This is mostly down to the picture-dulling APS and Intelligent Sensor modes, so turn those off and then tweak the usual settings using a THX Optimizer. Once calibrated, the LG looks more like a contender. In fact, play the bleak Never Let Me Go Blu-ray and it proves to have one of the most balanced colour palettes of the whole test. Although it loses out to its Full HD rivals in terms of sharpness, the LG has pretty impressive definition for the money. There’s good insight into blacks, too, but sadly that seems to be more down to the lightness of its blacks than anything else. In fact, even in bright scenes it’s clear that the LG struggles to dig up the kind of detail that the budget Samsung PS51D495 set manages to deliver. panel produces “zero motion blur”. Don the single pair of bundled glasses (make sure any extras you buy say AG-S250, as last year’s AG-S100s don’t seem to work) and the 3D performance is very respectable. True, there’s an element of shimmer that sacrifices a little solidity, and it’s unsurprisingly not as detailed as others given the HD Ready spec, but it is watchable, with vibrant colours and decent overall depth. The LG loses ground when you switch to standard-definition, either from DVD or the Freeview tuner, as its relative lack of detail and control is brought to the fore. It’s a bit noisy, too, especially if you’re watching a ropey film or weak broadcast. Also, weirdly, although Freeview has the same kind of colour balance as Blu-rays, DVDs look a touch overcooked. If you aren’t planning to add an audio system, you’ll be pleased to hear that the LG sounds pretty good for a flatscreen. Whether you opt for Infinite Surround or not, it’s relatively solid and controlled. 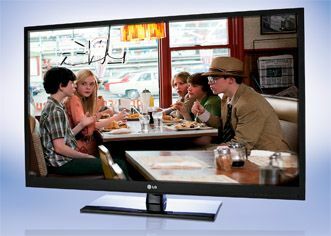 So, the LG’s not brilliant, but then no one was expecting brilliance from a TV this affordable. In fact, if it was the only TV this cheap we’d probably be looking at a four-star rating. The problem is that there are others at this price that prove that you can do better, even on a very tight budget.